Protein Pancakes – The perfect way to celebrate National Hot Breakfast Month! Happy Labor Day! I hope you all had a chance to take some well deserved R&R for yourself this weekend. I think Wayne had high hopes of doing the same thing until I came up with a BRILLANT project for him. I knew he would get bored while I was working away, so really it was pure thoughtfulness on my part when I asked him to build a buffet table for our dining room. You’re welcome babe! Thankfully he just so happens to be GREAT with a saw and never turns down a challenge; so as I headed off to work Thursday, he headed into the garage. I have to say, I was quite impressed with the final turnout! The only caveat to my master plan was that I had to cook for him. Lucky for me this was a treat since I had been out of the kitchen all week and was dying to come up with a new Simple-Swap. Since Wayne is in the final weeks of training for his Spartan Beast race, I decided to take a twist on the Simple-Swap Pancake and try to boost their protein content. Before I divulge the recipe, stay with me and check out the 4-1-1 on protein. Vital for providing structure, movement, building enzymes, hormones and other compounds (i.e. the brown pigment melanin uses an amino acid to color our eyes, hair, and skin), transporting substances, maintaining fluid & electrolyte balance, as well as a variety of other roles! High quality protein sources are best derived from foods! Bread, legumes, pasta and other complex carbohydrates like oatmeal also provide protein, however are not a “complete” protein. These must be paired with a “complimentary amino acid” to get the full SHA-BANG of an animal protein. Protein supplements (powders, bars, beverages) are widely used in sports nutrition to assist with providing an extra boost to athletes who participate in lengthy training sessions and need more calories than they can simply eat at meals. Research supports using whey protein to assist with muscle repair and recovery post strength training to increase lean body mass, strength and muscle size. 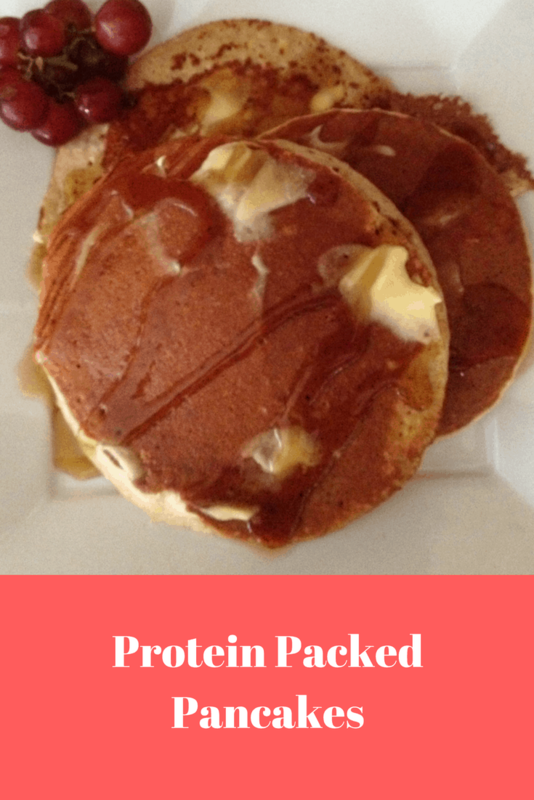 Now that you have a little more info on protein, let’s take a look at these simple and delicious protein pancakes! Mix all dry ingredients together. Gradually add dry into wet and mix until smooth. Heat griddle on stove top. Spray lightly with cooking spray and pour 1 scoop of batter onto pan. 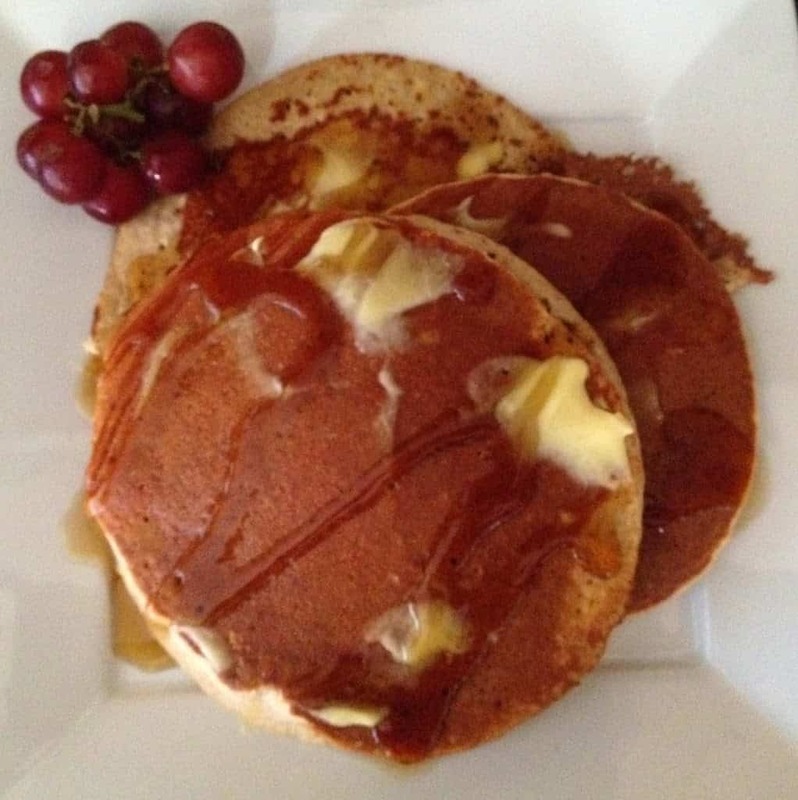 They cook faster than Simple-Swap original pancakes, so keep an eye and turn them quickly! 1 serving packs in over 20 grams of protein! That buffet table is beautiful! I love the pumpkin pie spice in this recipe. Pinning now!